Earlier this week, we pointed to a couple of claims suggesting that Apple is planning to launch the "iPad mini" on Friday, November 2, also making the case that the date is the most reasonable one given Apple's past history and the media event scheduled for October 23. Reports are continuing to pile on that November 2 date today, with TechCrunch reporting that it has received information from its own sources pointing to the same date. Our own source has also previously proven reliable with unreleased Apple info. German site iFun.de is also weighing in with its own report claiming that Apple has informed a major shipping logistics partner that it should be preparing for a significant boost leading up to that date. iPad mini = The beginning of another John Sculley era ? You can't possibly be serious. The market is clamoring for a cheaper, smaller iPad and it will be a huge success. Sculley was releasing stuff that sucked and nobody wanted. Try as I may, I just cannot get excited about this one. Retina? $299 for 16GB model? If so, SOLD! If not, SOLD anyway! Caption for the picture: "Hey cutie, what's 8 inches of magic that fits well in your hands? /SLAP/ Hey, I wanted to show you my iPad mini!!!" I suspect Apple's thinking is along the lines of - "we will not lose marketshare for this market we started." Apple started the "PC" market, then lost it to IBM and Microsoft. If adding a smaller iPad is something that will help them keep marketshare, then I think they're going to do it pragmatically. Agree that I have no excitement for this product either - at least not yet. no one is interested in the iMac. They've said it before, the screen is all. It's the way you interact with the device, it's the thing that matters most. No retina=no buy. Why would I ever want to trade down? You already have an iPad. In fact by your description you've bought two at this point. 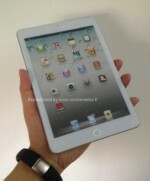 Apple isn't primarily interested in changing a high double digit percentage of iPad buyers into iPad mini buyers. The primary interest here is selling iPad minis to people who have not bought iPad's before. For example, in selling them to businesses that might want to use the "iPad" as a tool like ( hand held check out , displays , inventory checking/tracking devices , etc. ) or those on a highly constrained budget ( e.g., schools ). The mini's objective is to retire the iPad 2 and be more effective because it can hit lower price points without sacrificing quality. So having iPad 2 resolution for the first year isn't a problem. Most likely they are going to laminate the screen similar to the iPhone 5 (and rMBP ). The display will be slightly better, but the revolution wouldn't occur until Apple had a much deeper understanding of how the iPad mini fit between the iPod Touch and the iPad 2012 in terms of scale and what people want. Apple will more likely go for thinner ( laminating the touch sensor on the screen) before Retina. Apple's "thinner , lighter" obsession has been around alot longer than 'Retina' . That's actually going to be a challege is trying to go head-to-head primarily with an ereader. Lightweight one-handed use will be a factor. If they have to wait until iPad mini v2 to snag some retina iPad 2012 users that is likely just fine with them. Sometime in the late Winter or Early Spring they will tempt iPad focused folks with the iPad 2013 version. If they put a bigger gap between the mini and the iPad 2013 then it will be easier to fit a mini with Retina in there. Apple tends not to take big risks. Or at least not a large number of them at the same time. Apple will sell millions of iPad mini's even without a Retina display. That's kind of crazy. Your realize this right?